This is hands down the best potato salad you’ll ever make. The secret is in the sauce. Miracle whip makes the flavor pop compared to traditional mayonnaise. Hello! Welcome! The past several weeks I’ve been sharing recipes from friends and family. This week’s recipe is the potato salad my Mom makes. I have aunts that make it as well, passed down by my Grandmother. I can now say I’ve mastered it — the secret is in the sauce. Typically the sauce is a dump recipe. But not to worry! I’ve put together a measured recipe to share with you. The same sauce is used in one of our favorite macaroni salads — Not Your Store Bought Macaroni Salad. Plus it’s the topping to our traditional Christmas Eve lemon-lime jello, carrot and pineapple salad. Hey, don’t knock it until you try it! 🙂 I’ll make sure to share the recipe closer to the holidays. I’ve already shared a few great recipes I’ve learned from my Mom. Be sure to check out her Bread Machine Bun Recipe. So delicious! And someday I hope to share her famous tea ring. Alright on to the best potato salad you’ll ever make. 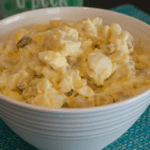 🙂 Say goodbye to store-bought potato salad because this recipe is simple and tastes amazing. 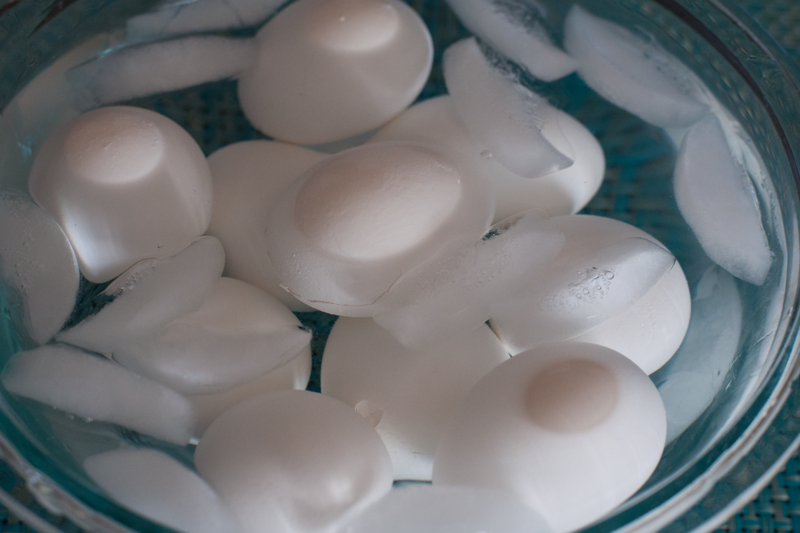 Place the eggs in a pot with cold water. Bring to a boil. For perfectly hard boiled eggs, use a color changing boiled egg timer. Add the timer to the pot at the same time you add the eggs. When the color changer reaches the hard-boiled line, you can remove them from the heat and add to an ice bath. Peel and dice once cool. While you’re boiling the eggs, you can also boil the potatoes. I leave the skins on until after they’ve been cooked. (Or leave the skins on entirely for a little extra color in the salad.) Boil until tender – check by poking with a fork or slicing easily with a knife. Run under cold water, peel and chop into smaller chunks. Dice onion and pickles. 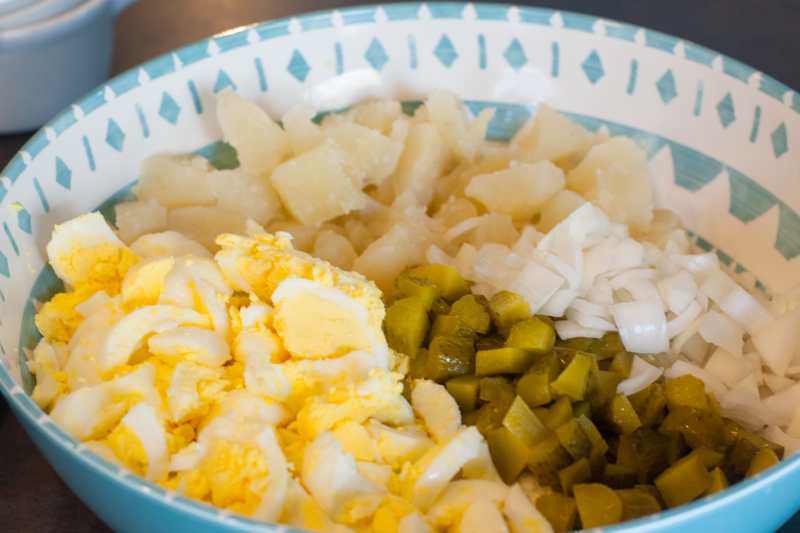 Add the chopped potatoes, eggs, onions and pickles to a medium-sized serving bowl. Now for the sauce. In a separate small bowl, mix the miracle whip, mustard, milk, sugar, and salt well. It will look a lot like custard. Fold the sauce into the potato mixture. Very important — make sure all ingredients are cool before adding the sauce! Chill for a few hours before serving. Pairs great with grilled hamburgers, brisket, barbecue baked beans and more. Enjoy! Please stop by and say hi in the comments. 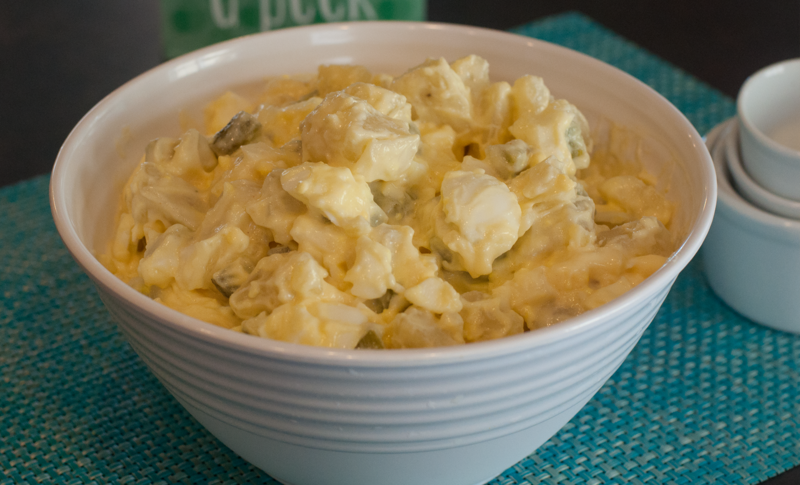 What is your favorite way to prepare potato salad? The best potato salad you’ll ever make. The secret is in the sauce. Miracle whip makes the flavor pop compared to traditional mayonnaise. Boil eggs, peel, dice and cool. Boil potatoes, peel, dice and cool. 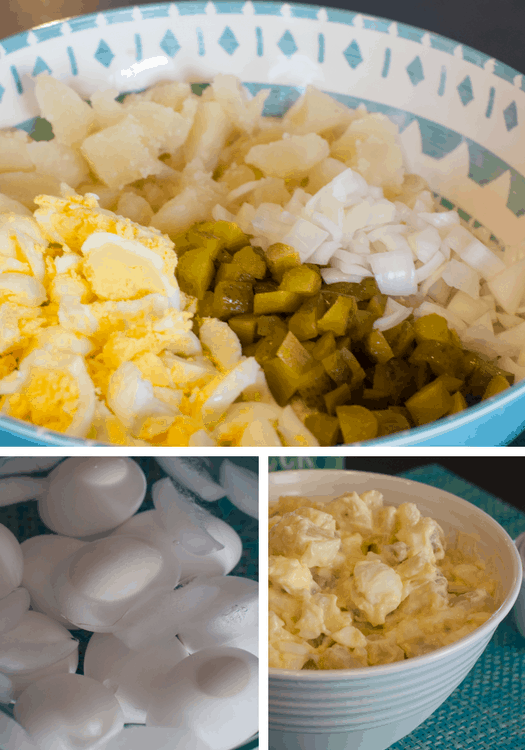 Combine eggs, potatoes, pickles, and onions in a medium-sized serving bowl. Mix the miracle whip, mustard, milk, sugar, and salt to make the sauce. Fold the sauce into the egg, potato, pickle and onion mixture. Add more milk to reach the desired consistency of the sauce. It’s definitely the easiest way! Haha! However, when you do make this recipe you’ll have a hard time going back to store bought. 🙂 Thanks for stopping!